Yesterday, the Indiana Department of Transportation (INDOT), under the leadership of Governor Mike Pence, joined newly elected Illinois Governor Bruce Rauner and the Illinois Department of Transportation (IDOT) in putting his state’s commitment to the Illiana Expressway project on hold. The Illiana would run through cornfields and cost as much as $3 billion to build, putting taxpayers at risk of bailing out an unnecessary road while crowding out other transportation priorities. A year ago, the highway was a top priority for former Illinois Governor Pat Quinn and seemed inevitable. Rauner’s election has reversed the momentum, but the question remains: What needs to happen to kill the Illiana boondoggle? It’s clear what’s necessary for a proposed highway to be completely approved and funded, but how does a proposed project finally die? There are many good reasons people aren’t embracing the Illiana. The private financing that taxpayers had been led to believe would cover the cost of the project was a mirage. IDOT sweetened the deal for its private partners, promising road builders a set amount of scheduled payments no matter the level of toll revenue. In other words, the public was on the hook for any shortfall. And with high costs and low levels of use, the shortfall would have been large. IDOT was forced to reevaluate the initial traffic projections for the Illiana when the regional planning agency, the Chicago Metropolitan Agency for Planning, forecast that just 20,000 vehicles would use the planned expressway per day, which is a third of its capacity. Less traffic means more risk for taxpayers. CMAP staff predicted a shortfall of up to $1.1 billon in toll revenue. It became increasingly clear that moving forward with the Illiana would mean siphoning off public funds and preempting much more useful projects, like bringing transit systems into a state of good repair. Illinois needs to move forward. First, the Illiana needs to be removed from the approved project list for future transportation funding. Its current position atop that list is a threat to every project beneath it. Illinois needs to be able to plan and prioritize for future infrastructure investments, and the Illiana makes a mockery of that process so long as it stands first in line for future tax dollars. Next, Illinois needs to do more than heave a sigh of relief. Policy makers need to examine how this boondoggle could get to the top of the state’s declared list of funding priorities. They need to ask what reforms are needed to prevent the transportation investment process from being hijacked in the future. Despite all the long-range planning and performance measures of CMAP’s acclaimed 2040 plan, how is it that the lure of ribbon cuttings for highway mega-projects still holds so much sway? Too many times, projects that lack merit nonetheless gain favor because they are billed as public-private partnerships. These projects often get a free pass because their financing is opaque, and it’s tough to discern that they are ultimately paid for by the public. Private financing should only be approved if the project deserves to be a priority and there are real benefits to financing it this way. Illinois needs infrastructure for the future. Projects like the Illiana can’t be allowed to play havoc with the transportation planning and investment process. The Illiana should be put out of its misery for good, and steps need to be taken to protect against such abominations in the future. Kathleen Woodruff is National Field Director with the U.S. Public Interest Research Group. While it may seem hard to imagine this awful project getting commitments of support from the Illinois governor at this point, if a private bidder emerged, it could change the politics. There needs to be more official recognition that this isn’t a favored project. A set amount of revenue to earn for a toll road? Isn’t that the antithesis of the benefits that a good public-private partnership is supposed to provide? I hope the new airport down by the Illiana faces the same scrutiny. Chicago already has “third” airports in Gary and Rockford. Time to widen the Borman to 8 lanes in each direction, with separate lanes for trucks. $3 Billion spent on active transportation infrastructure instead of this boondoggle wold make Indiana and Illinois world leaders. Well articulated, Kathleen! And yes, the Peotone Airport should be stopped, too! Remove the guns from the heads of Eastern Will County farmers. The solutions to the economic problems in Cook County, need to be developed in Cook County. Transportation solutions need to include the input from genuinely interested citizens, who have the welfare of their communities at heart and those running transportation systems – not politicians looking for votes with wild job-projections using inflated projections, and deflated cost-projections. Be honest with people and give them a real stake in their future – not empty promises. Let Peotone finally celebrate being Peotone! Finally an article telling the facts not government fantasy! Do you have a link to the announcement? The first link goes to the Illinois announcement. All news I found was that “The State of Indiana remains committed to this project…” according to the letter. Still promising either way. What is needed is an I-480 bypass of the congested Kingery-Borman I-80/90/94 that connects Morris back into 80-90-94 region out by Michigan City allowing non-Chicago traffic to avoid the region. I was enroute Champaign to Michigan and had no idea that 30 mile stretch was 2 hours of 15mph stop and go traffic. 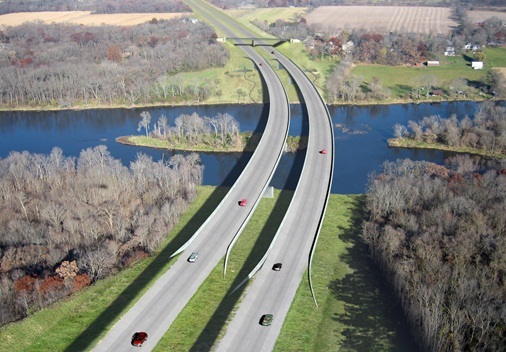 The Illiana as envisioned did not serve that function and was poorly conceived unless it was part of a new Interstate 480 bypass out in the cornfields past the metropolitan area.